The structure indicated is the fibularis (peroneus) brevis muscle. The lateral muscles are responsible for eversion of the foot and are innervated by the superficial fibular (peroneal) nerve, which is a branch of the common fibular nerve. The common fibular nerve is a branch of the sciatic nerve and divides into the superficial fibular nerve and the deep fibular nerve. The deep fibular nerve innervates the muscles of the anterior compartment of the leg. 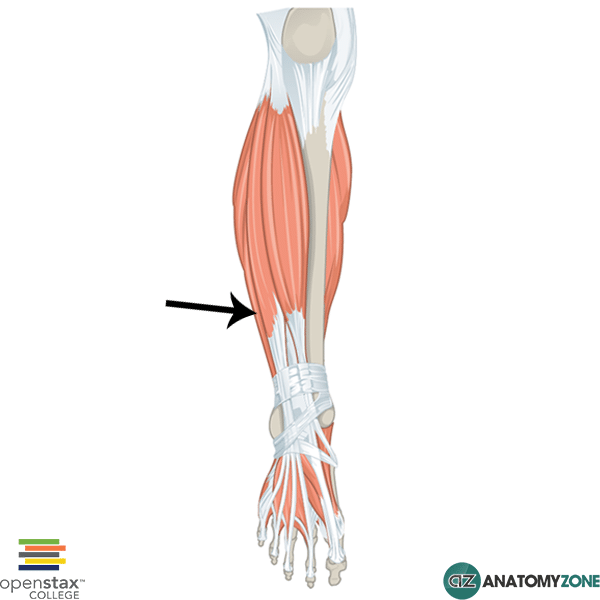 Learn more about the muscles of the leg in this tutorial.